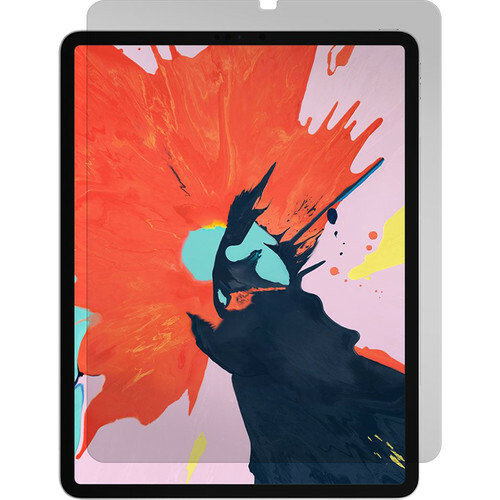 Protect your iPad Pro's display from scratches, fingerprints, and smudges with the Black Ice Tempered Glass Screen Protector from Gadget Guard. Designed to fit the 2018 model of the 12.9" iPad Pro, the optical-grade, scratch-resistant Black Ice Tempered Glass Screen Protector measures 0.33mm thick and has a 9H hardness rating. The screen protector also boasts rounded edges and a coating that helps resist fingerprints and smudges. Two dust removal tabs plus wet and dry cleaning cloths are included. Box Dimensions (LxWxH) 13.5 x 9.2 x 1.0"